Whoever invented Mini-Golf is a genius. The great thing about Mini-Golf is that it scales down everything about the game, from the size of the field, the time it takes to play, and even the cost. If they could shrink the game that much, why stop there? Why not make a Mini-Mini Golf game that's small enough to fit in your living room. 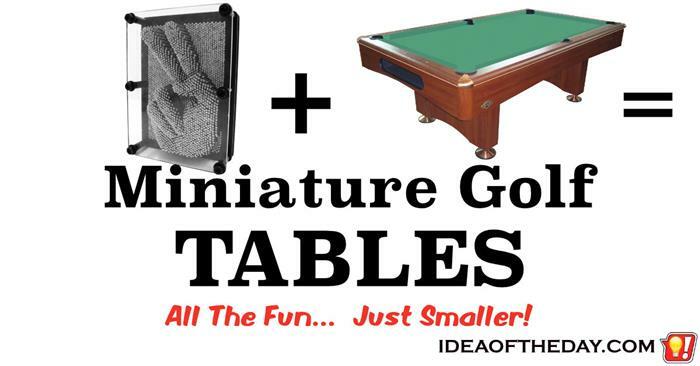 About the size of a pool table. Here's how you can not only use one table for 18 holes, but create an unlimited number of holes, traps and other obstacles that can be re-configured on-the-fly. MIT calls this technology "Tangible Media", which basically is a series of re-positionable surfaces that can be moved up and down like pixels on a screen.